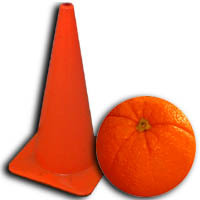 Image: Construction cone courtesy of New York State Department of Transportation. Orange courtesy of Korean market on the corner. Any resemblance to the 1939 World's Fair logo is purely coincidental. New York (Capital of the Known World) - In the wake of the scandalous revelation of how Andriy Yushchenko, the 19-year-old son of the president of Ukraine, is alleged to have accumulated great wealth after being granted the copyright for symbols of the Ukrainian people's "Orange Revolution," a spate of similarly unethical (or illegal?) claims have been made around the world by various high profile political figures and their offspring. Shortly after the Internet news website Ukrayinska Pravda (website) broke the story in Ukraine that the president had transferred ownership rights of reportedly trademarked revolutionary logos to his son, it was announced that President Shakashvili of Georgia, whose path to power was coined the "Rose Revolution", had given his eldest son the rights to all roses sold in Georgia. Elsewhere, Vaclav Havel, the Czech leader who rose to power by virtue of the "Velvet Revolution," is at the center of a dispute with the sons of the current president (Vaclav Klaus) over ownership rights for the production of velvet in the European Union. The winner of the recent hotly contested election in Kyrgyzstan, (a.k.a. the Tulip Revolution), on the other hand, appears to be losing his bid for the rights to tulip bulb distribution. Holland has been in control of its renowned tulip markets for centuries, and is unlikely to permit a Central Asian newbie to the global market democracies to wrest control of this profitable industry from its established business leaders. Not to be outdone, U.S. president George Bush, who has benefited on many fronts being the son of oil mogul and ex-president George Bush Sr., has laid claim to the "Stars and Stripes", a.k.a. "Old Glory", "Star Spangled Banner," otherwise known as the American flag (heretofore thought to be owned by the most conservative wing of the Republican Party). Somewhat less controversial, yet bound to have a resounding effect throughout the Western world, President Bush has also awarded the letter "W", a.k.a. "Dubya", even-steven to his twin daughters -- presumably one "V" for each of them, neither "V" bearing any relationship to the dueling Vaclavs in the Czech Republic. Q. Are you a rich man? A. No, I'm not. It's a shame to be rich in a poor country. In an effort to even outdo himself in the race for previously unprivatized commodities, Andriy Yushchenko has now acquired unlimited rights for chestnuts, known as "kashtany" in Ukrainian (revolution market-eers originally expected to call it the "Chestnut Revolution", but the name never took off). "Kashtan" was also the official Soviet name for a chain of "dollar stores" in the days when the ordinary Soviet citizen did not have access the goods made available in these elite shops strictly for hard currency. Publishers of history books, reacting to concerns about copyright infringement, are considering new names for the shops, such as "Nutshell", "House of Nuts", and "Nut Hut" (where "Hut" is short for "Hutsul", a regional people living in the Carpathian Mountains - a favorite ski destination of the president). This is not to be construed as revisionist history, but merely as compliance with the new standards in interpretation of the law of Ukraine. More importantly, the president of Ukraine has just signed a decree awarding his son the rights to the color "orange." This is seen to be a particularly lucrative move as orange is the color used in danger and caution signs by U.S. state highway departments. Think of the number of construction cones! Not to mention orange juice - the breakfast drink of choice in the U.S. (The State of Florida has already filed a restraining order to protect its primary resource. The State of California has not made a move yet to protect its orange groves, citing its failure to adequately pursue the illegal actions of former Prime Minister of Ukraine Pavlo Lazarenko.) Not missing a beat in protecting the family fortune, Ukraine's First Lady has announced that she will be taking an autumn tour of all Paris couture houses, where orange has experienced a post-"Orange Revolution" popular revival as a fashion statement. "It conveys health, brightness, yet it is so very cheeky," quipped one of Kyiv's top models. "In America, satire is protected speech, even if the object of the satire doesn't get it."  Al Franken to his publisher after being sued by Fox News for use of the phrase "fair and balanced." Queen Beatrix of The Netherlands may be challenging the Ukrainian for a stake in the color orange, as her eldest son is none other than Prince Willem-Alexander - the Prince of Orange. Word has it that Russian president Vladimir Putin, now in competition with Ukraine for world attention, has designs of his own on lemons and the color yellow. While yellow has the misfortune of being associated with weakness and lack of courage in American culture, Russia's president is desperate for any color that is still available on the world market and will waive off such concerns as Western conspiracies to undermine his re-vamped neo-nationalist policies. Lemons are, of course, a reference to machinery that just won't work no matter how many repairs it undergoes. "Remember the submarines!" has become a rallying cry in Russia among those who support their leader's choice. A spokesperson for the Ukrainian president has come out in defense of the actions taken, saying that 19-year-old sons of presidents have the inalienable right to earn millions too. Disclaimer I: The color orange, the letter "W", and other symbols claimed as private property are used above under the fair use rights under Article 107 of the Copyright Act of the United States of America: "Notwithstanding the provisions of sections 106 and 106A, the fair use of a copyrighted work, including such use by reproduction in copies or phonorecords or by any other means specified by that section, for purposes such as criticism, comment, news reporting, teaching (including multiple copies for classroom use), scholarship, or research, is not an infringement of copyright." Disclaimer II: Any resemblance to real events, colors, words, or persons living or dead, is purely coincidental. Disclaimer III: In the event that you needed a clue, this is a satirical viewpoint expressed by an unidentified writer.